This week our soul journal prompt was to create a personal lexicon. I selected certain letters of the alphabet and wrote down words that came to my mind when I read that letter. These words are what I would consider to be my personal lexicon. Although the prompt was to use lots of colors and pictures, I decided to challenge myself and only use black and white for the colors and only letters and doodles for the spread. This was a fun and interesting prompt, particularly since I “see” things as black or white, yes or no. I rarely see the grey areas in life. I will try this prompt again in the future, this time, using all of the colors and pictures. Are you interested in Soul Journaling? Check out Sarah Whitmire’s blog and consider joining the Soul Journal Yahoo Group. We are a warm and friendly group of artists and welcome new people with open arms. I’ve been tagged for the very first time, and I was double tagged at that! (see my blog for details). Well done! 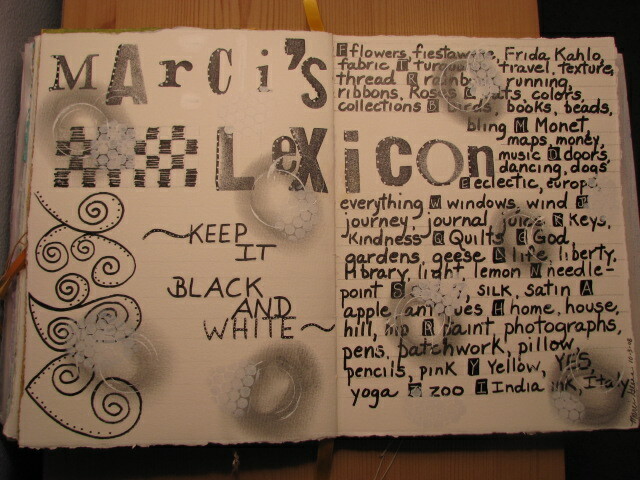 I am really partial to black and white, and the combination of letterstyles punches it up…isn’t doodling the best fun? You’ve been tagged! Swing by my blog to learn more. You are doing a great job on your journal pages and you are a very dear soul sister – always there to encourage EVERYONE. Many, many thanks to you!